The rain has been so erratically heavy for the last few days that it's put a damper on my outside time. We got so much rainfall that it would border on dangerous for visibility on a bike for our country roads. So I had to go with a Plan B yesterday. Water falling from the sky is no issue when you're floating on top of water. So I pulled the kayak down for a morning paddle before work. The dense fog and cool temps made for a perfect time on the Kentucky River. I took a thermos of coffee, a book and a sling shot. All of which kept my time balanced and well rounded. Sip some coffee... read a bit... try to shoot a groundhog with the sling shot. All while watching the sun rise. That's time well spent. You don't gain a lot of ground... er, water when you're in a kayak. You're certainly moving slower than being on a bike. But you still see some amazing sites. And it's much more peaceful. I didn't see another soul on the water for about two hours. And I park down stream and paddle up. So what takes 45 minutes on the way in is only a 15 minute paddle on the way back. It works out well for those sore arms. They're resurfacing the road I ride on my commute. It's rrrrrruuuuuuuuuuuuufffffffffffffff. Too bad to ride on. They've done the work to rough up the road but haven't started repaving yet. So I'm going to have to take an alternate route until they're finished up. I got caught on it yesterday and it was awful. I ended up pulling over and airing my tires down to 10psi. That helped a ton. But it's still to whacky to ride on for more than a couple minutes at a time. I've been wanting to take some time off of work for a 50 miler for a while now and it finally came to fruition last week. There's lots of roads, rivers, lakes and nature preserves near my house that I've wanted to explore for a long time and I finally took the initiative. Most trips out my door head west. This one was south. And it was beautiful. Just south of my house is Camp Nelson Cemetery. It's always worth a quick spin through, some contemplation and a prayer. I planned 40 miles with the hopes of 50. But I wanted to give myself the wiggle room to explore random roads that I encountered in person. Sometimes roads on a map won't represent how awesome they are when you pass them at 14mph and I wanted to give myself an opportunity to ride those. The photo above is a small example. It was closed off and completely covered with debris. But was a great road for weaving in and out of trees and exploring. I meandered through farm country and became eye candy for the longhorns for the first 15 miles or so but soon encountered my first major route change. I neglected to take a photo in the moment, unfortunately. But one of the gravel roads I was one for a half mile eventually ended with a menacing gate. Although marked publicly on the map, it was a private road and it's inaccessibility meant that I was going to have to ride a good six or seven miles out of my plan to get where I wanted to go. Not a nuisance, though. That is exactly why I mapped fewer miles than I actually wanted to ride. After my reroute, I made my way to Kennedy Bridge on Herrington Lake. Herrington was my family's vacation spot when I was a kid. So pedaling over it was one of the highlights of this ride. Having lived close to Herrington for nine years now, I've never actually laid eyes on it since I was a kid. So it drummed up some fun memories. After Herrington was miles and miles of corn. Next stop, Burgin: A Friendly Little City. I sat here for a while and ate. At this point, I had climbed out of the river and climbed out of the lake and was a little pooped. But it was nothing that a peanut butter and jelly sandwich couldn't fix. Simplicity, donkeys, sheep. I'd never taken a peak into Shakertown before. It's quite quaint... and quiet. And from Shakertown, it's pretty much downhill back to the river. Just before the river, though, there's a 175 year old church. Pretty spectacular, actually. After Mt. 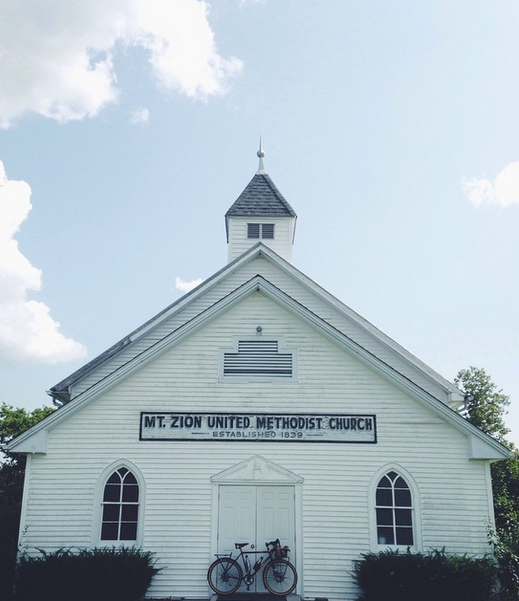 Zion Church, I coasted for about three miles down to the river. Probably the most uplifting part of the whole ride. Super fast and fun through BEAUTIFUL trees and nature-scape. But after the river, it's all uphill from there. As I mashed the pedals uphill, I found a little trail that shot off to the right of the road. I had the time and needed the break so I aimed the bars that way. A little gravel and dirt path led me to the photo above. Super cool tunnel in the middle of nowhere. Keep following the path and you'll hit a rope swing right into the river. I was very tempted to swing in for bit but I resisted. There was more climbing to do. From there it was climbing, climbing and climbing. The three mile descent became a three mile climb on the other side. It was tough. Really tough. My ride was pretty much over but this last little bit toasted me before I made it back to my car. It's exactly how you want to feel when your ride is over. 49.9 miles. Couldn't have gone any better. Yesterday, myself and three hombres headed out to the Life Adventure Center in Versailles to try out a new MTB spot. It's been rumored for a couple years now and the first couple reports were of the "It's not quite finished but it'll be awesome," variety. Well, yesterday proved to be worth of the drive out to the country. The first part of the trail is smooth and scenic. It starts with a bit of a cow-path vibe but eventually dives deep into the woods. There's several creek crossings and a few little points of interest. After a long while of coasting through the woods, you'll realize that you're gonna have to climb back out. And it's deceptively long, too. I kept thinking it would end soon but we just kept rolling and rolling. We rode hard for 30 minutes before we stopped. It was just fast and fun and we didn't need a break. And, unbeknownst to us, soon this rest is when the climbing would start. We climbed a lot. I've been putting in a lot of road miles recently. But this dirt stuff in the heat just killed me. The photo above isn't Pat posing. That's a genuine suffer-face. Random note: I saw Pat run over a snake with them massive Pugsley tires. Snake didn't know what hit him. Jason wondering when he last water-proofed his leather saddle. We all rained sweat down upon our steeds as if it were a downpour. We had to scoot outta there pretty quick towards the end. Jeff and I had to get to a meeting and we didn't allow ourselves enough time to suffer through those climbs. So we hammered it hard for the ride out and bailed on the last section by cutting through a field. Good thing, too. I was on the Troll which hasn't been ridden much recently. I neglected to check the tire pressure and I was rolling pretty sloshy in the rear end. So I narrowly avoided a pinch flat, I fear. So the verdict? If you live within 30 minutes of the Life Adventure Center, you should TOTALLY make the drive. It's worth the change of scenery for sure. If you're a Lexington rider, it's probably a mix between Veteran's and Skullbuster. You won't regret the drive out. Sunday led to another great ride on the Cross Check. I'm really digging this bike these days. I overhauled the wheel recently, and though it was probably just placebo, it felt like it rolled a little faster. And, although the Cross Check was rolling faster, I was not. About 10 miles in I was toast. I think I've got a little bug dragging me down. I can't seem to keep much energy. So I pulled off the road, sat on a bench at a little country church and ate a poptart. After that, I leisurely made my way back home. It was a 20 mile total. But it was slow 20. No mind, though. It was just nice to be out. I've put thousands and thousands of miles on my Cross Check. And during a recent ride when I broke a spoke, I realized that I've done nothing to it. It's had the occasional tune-up of chain maintenance and brake checks. But I've never replaced a part or overhauled a single component. You can't beat that durability. But it did cause me to look into the bike with a bit more depth. And upon that inspection, I realized the rear wheel would barely spin. One might not notice on the bike. But when I had it in the stand and gave it a spin with my hand, it wouldn't even go a full rotation before it came to a quick stop. Time to overhaul them bearings. I had never done anything to a rear wheel (aside from a little cone adjustment). But the internets offered clear instructions. So after about 10 minutes of video tutorials, a trip to the bike shop for some grease & bearings and 20 minutes of sitting at my kitchen table with the wheel... the job was done. It was super simple. And apart from the Phil's bearing grease, I had everything I needed already. There was really only one bearing that looked bad. But it looked really bad. And there was all kinds of debris and nastiness in the hub. So here's to smoother spinning from here on out. The good news is, I received shipment of some nice Panaracer Paselas for the Cross Check yesterday. This is the first time in a long time that I've bought something for a bike that it didn't really need at all. I had a great set of tires on it. But I've been wanting some tan walls for the Cross Check for a while and I found these for $16 each with free shipping. What?! I know. I couldn't believe it either. I went back to the online shop that I bought them from and they're already $32 each again. I somehow bought them at the perfect time. I did a 32 mile ride today and started hearing a pinging sound about 12 miles from home. I didn't want to look. When I got home I saw this. Boo. So I'll be heading to the shop for a little spoke love tomorrow. Bad luck to get some sweet new tires on the very same day I break a spoke! That's the bad juju I get for buying something I don't need... as soon as I do something I do need breaks on that very bike. I don't think I torqued the wheel by riding it all the way home. I assumed it was a spoke but I was 20 miles into a ride with a heat index of 90 degrees. So I just wanted to be home. I didn't want to sit on the side of the road and fiddle around with a mechanical. This blog is a place that I use to write down my thoughts, track my bicycle adventures and share with others. I love my family more than anything. But I have a strong love for bicycles as transportation, as well. We're in Lexington, KY riding bikes almost every day.